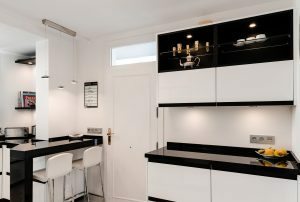 An elegant recessed handle free door with solid wood accented in thehandle, creating a modern contrastive interpretation, in this black &white kitchen. The wood is black stained oak, but can also bemanufactured in many other types of woods and colours. Offering youthe possibility of choosing exactly the look of your dreams. In this kitchen you can see a flush installed custom gas burner &stainless steel sink.